To celebrate five years of NT100 we’ve revisited Black Girls Code to understand what’s helped the initiative grow, since it featured in our 2014 NT100. When Kimberly Bryant studied electrical engineering at Nashville’s Vanderbilt University in the late 1980s, she was the only African American, and one of only a handful of women in her class. She felt invisible in front of her lecturers, who she says looked completely past her. Although she went on to have a successful technical career in the pharmaceuticals industry, Bryant found the experience isolating. Hoping that much had changed in 20 years, Bryant had higher expectations for her daughter Kai, aged 10, when she started showing interest in computer games production in 2010. She enrolled Kai in a summer coding camp at Stanford, telling her to enjoy herself. She was shocked when Kai came back to describe a similar scenario that Bryant herself had experienced at Vanderbilt. Just like her mother, Kai was the only African American girl at the camp, and one of a small handful of girls. When Bryant researched data on diversity in the tech sector in the US, she found that things have actually got worse since the late 1980s, when 36% of computer science graduates were women. Today, only 15% of computer science degrees are awarded to women, according to the US National Center for Education Statistics. The figure has been dropping steadily since the 1990s, from 35% to 15% in the last 15 years. The contrast is exacerbated when the data is broken down further by ethnicity. “When you look even deeper into these numbers, you’ll see the number today is about 3% for African American women, and it’s about 1% or a little bit less than that for Hispanic women,” says Bryant. Crucially, this lack of diversity translates into the workforce. 2016 figures from the Bureau of Labor Statistics show that only 3% of people holding computing jobs in the US are African American women, and only 1% are Latina or Hispanic women. Recent diversity reports from tech giants paint a similar picture. Google said that 30% of its overall (not necessarily technical) US workforce is female, and just 2% is black. Facebook revealed that 31% of its total global workforce was made up of women, and just 1% of its US employees were black. Having struggled against the odds to pursue her own career, Bryant was adamant that her daughter and her peers, the new generation of potential skilled tech workers, would follow a more supported path. Shortly after Kai returned from camp, Bryant ran a workshop for her and a few local girls of colour. In 2011, she established Black Girls Code, a non-profit that provides a subsidised programme of classes, summer camps, workshops and hackathons, focused on teaching tech skills to girls of colour. Girls as young as seven and up to the age of 17 can take part. Some classes are free, otherwise prices start at $35 per student for a one-day workshop, and go up to $150 for one week of summer camp, although 50–70% of participants attend for free on a scholarship, depending on location. Between 50 and 70 students take part in each class on average, though in some cities demand pushes up attendance to over 100. Regardless of the number of students, Black Girls Code keeps the ratio of students to staff at two to one, relying on a wide range of volunteers with a mix of demographic and socio-economic backgrounds. In a typical class of 50 students, there will be 25 volunteers, some technical, some non-technical. About 9,000 students have gone through Black Girls Code to date, via 14 chapters: 13 in the US and one in South Africa. The non-profit now employs 15 people, equally split between an office in Oakland and a new work space in New York City, donated by Google. When asked about being more inclusive of all girls as well as boys of colour, Bryant has a positive answer about the need to address a particular barrier to diversity that lies at the intersection of gender and race. And while Black Girls Code has had a lot of requests for co-ed classes from friends and family members with boys, the charity decided to connect with other organisations encouraging boys from ethnic minorities to code, so they can focus on providing girls with a nurturing environment where the attention is on them in their particular programme. As well as its large network of volunteers, the organisation relies on large donations from corporate partners. “About 75% of our funding is based on those corporate donors that we create partnerships with either on a long term basis (so it could be multi-year) or with a focus on one event,” says Bryant. “About 15% comes from more traditional philanthropy foundations. The rest are private donors as well as individuals,” she adds. Black Girls Code has received full support from leaders in the sector. The largest corporate donations this year came from AT&T at $475,000 and General Motors (who are investing in more tech jobs with a focus on self-driving cars), at $255,000. Google, Verizon, FedEx and Comcast are among a whole number of corporates who have also made significant donations. Bryant is judicious about her choice of corporate partners. She famously rejected a $125,000 grant from Uber earlier this year, telling TechCrunch that the offer seemed “more PR driven than actually focused on real change.” Black Girls Code in fact exceeded that amount in crowd funding the following month. Bryant says that Black Girls Code is currently fully funded for the next two years, and that the team is working on building more sustainability into their financial model. As Black Girls Code continues to grow, with sights on new chapters in East Africa, Canada and eventually London and Paris, Bryant is looking at how best to best measure impact. Her focus now is to see how participation in Black Girls Code is impacting girls’ performance in maths, science and literacy at school and to monitor college applications for computer science degrees, as Black Girls Code alumni start entering college, including her own daughter. 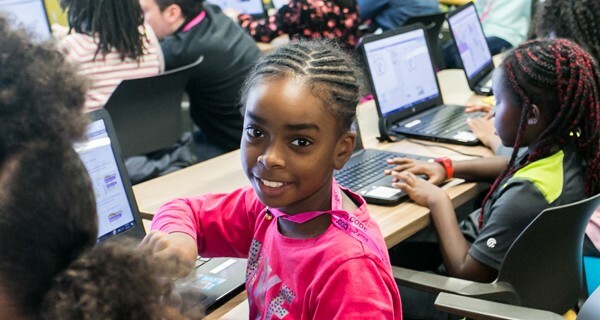 One of Black Girls Code’s most inspiring success stories is that of 11-year-old Aita. One of 10 children in her family, she had no interest in computer science when her parents signed her up for a Black Girls Code class. Over the course of two years, she thrived in the programme, quickly becoming a leader among her peers. Her own school noticed Aita sharing her coding knowledge with her classmates, and a teacher asked her to teach a peer-to-peer technology class. Now 13, Aita continues to learn new programming languages so she can teach others. The bottom line is that the more girls acquire computer science skills, the more they can not only support each other, but also mentor and teach. The effect is cumulative. “If we teach one girl to code, she will teach ten more,” says Bryant, who aims to reach one million girls by 2040.